If there is a successful example on how countries can unite together under one single roof, the European Union may provide the answer. What the European Union (EU) has achieved is unprecedented, not even close, by many organizations that try to mimic, or at least try to achieve, what the EU has achieved. This essay will discuss in a concise manner about the European Union, how it works, and how it defines the world, as we know today. The establishment (and success, to a certain extent) of the European Union is often attributed to the supranationalism concept, where countries (particularly in a certain region) “surrender” a part of its sovereignty to an organization placed higher than the countries. The European Union is also often dubbed as a successful example on regional integration, in which the European Union has successfully entered the final part of the regional integration, which is the political integration. The European Union (EU) is a political and economic union of twenty-seven countries across Europe. The EU uses a mixture of supranational independent institutions (those at the level of Europe) and intergovernmentally-made decisions negotiated by member states. Current system of the EU also allows free movement of people, goods, services and capital; along with common policies on trade, agriculture, fisheries, and regional development. One of the greatest achievements of the EU, not approachable by any other forms of regional integration until now, is the unification of monetary union, which is the Eurozone, created in 1999, allowing members to replace their own currency with Euro. 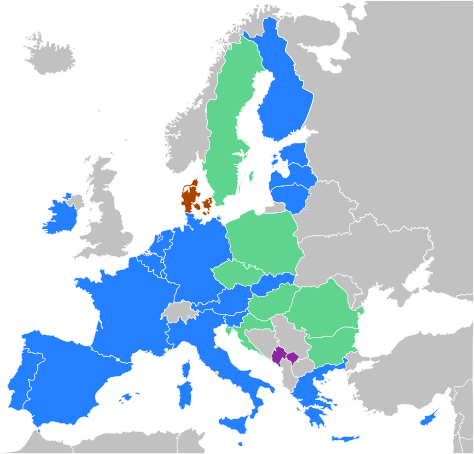 Eurozone currently comprises of seventeen member states. The history of the European Union can be traced back to the end of the World War II (1939-1945), and the condition of post-war Europe. Europe was devastated due to the global armed conflict, and it was at that decade that the Marshall Plan was given by the US to rebuild Europe from scratch. This was the answer to the truth of relations between practically two of the largest countries in Western Europe: France and Germany. Both countries involved in a war of coal and steel, especially due to their location, which is in proximity to some of the largest rivers in Europe, where barges passed and commodities are traded. On May 9, 1950, an organization named European Coal and Steel Community (ECSC). It began as a group of a number of Western European countries that finally gave birth to the EU we know today. In 1979, came one of the most important innovations created by the EEC, which is the European Monetary System (EMS). The EMS was deemed complicated by that time: all EEC members belonged to it, but membership of its inner circle, the Exchange Rate Mechanism (ERM) included only those willing to accept stronger monetary constraints. Both the EMS and ERM would later prove to be a significant link for the renewal of integration, especially the creation of the Euro. By the end of the 1980s decade, there are question on whether it was possible to remove all borders inside Europe until the beginning of the 1990s. Leaders of the European countries then held an intergovernmental conference, producing the Single European Act (SEA), a modification of the 1957 Rome Treaties. The “1992” (the timeframe first proposed for removals of inter-Europe borders) then became a slogan that created public excitement. In 1991, a yearlong conference held in Maastricht, the Netherlands culminated the drive for the European Monetary Unit (EMU). Maastricht also placed a number of fundamental key issues regarding the integration of Europe, starting from creation of a political union, the creation of Schengen (opening borders between members) and the standards for European citizenship. By then, the European Union was born, through the Maastricht Treaty on European Union (TEU). 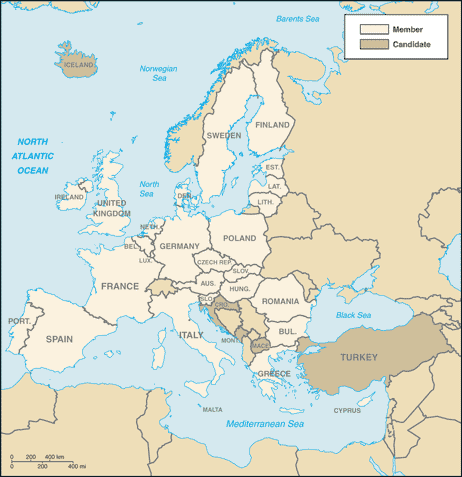 Until this year (2011), the European Union currently has 27 (twenty-seven) member states. It includes practically all states in Western Europe, almost all Scandinavians (with notable exception of Norway), and is currently opening for Eastern and Central European countries. The statistics regarding the member states of the EU, when being seen collectively, is staggering. Collectively, the population of EU is around 493 million people (July 2010), if EU is considered as a country, it would be the third most populous, surpassing the US. Collectively, they also have a Gross Domestic Product (official exchange rate) of almost US$16 trillion, which will have a stature when compared to the World’s total annual GDP (dubbed the Gross World Product): about US$62 trillion. Conclusion: EU’s economy is about a quarter of the World’s economy. Acceptance to the Community acquis: ability to take on the obligations of membership, including adherence to the aims of political, economic and monetary union. Only after the above set of criteria is met then the European Council will convey to negotiate the accession of the applicant into the European Union. This section will briefly discuss about institutions of the European Union. The institutions of the European Union is based on the treaties establishing the European Union, which among them the Treaty on European Union. The treaties act as foundation for three pillars: the pillar of community domain, common foreign and security policy, and police and judicial cooperation in criminal matters, which make the European Union stands. These are a number of important institutions of the European Union, along with a brief explanation on each. This is the ‘directly elected legislative arm of the European Union’. Members of the European Parliament (EP) do not sit in national blocks, but in EU-wide political groups. The Parliament is based in three countries. The Parliament has three main roles: to pass European laws, to supervise other EU institutions, and to authorize budget for the EU. The Council is the EU’s main decision-making body. It represents the member states, and its meetings are attended by one minister from each of the EU’s national government. The council has a number of key responsibilities, among them: to pass EU laws (with the EP), conclude international agreements, to coordinate the broad economic and social policies of the member states, etc. Votes are taken in proportion to the population: France, Germany, Italy, and the UK has 29; the Netherlands 13; Austria, Bulgaria, and Sweden 10; Malta 3. The job of the Commission is to represent the interests of the EU as a whole. The Commission can be aligned as the executive arm of the EU, responsible of implementing the decisions of Parliament and the Council. The European Council is not a formal organization. The European Council is the assembly of Heads of State or Government of all EU countries, plus the President of the European Commission. It meets four times a year to agree over EU policies. Assent: the Council has to obtain the EP’s assent before certain very important decisions are taken; mostly regarding agreements with other countries and accession of new members of the EU. In terms of political integration, no doubt that the EU sets the bar pretty high, in terms on how other regions may try to catch up what the EU has achieved until now. No other regions until today has been so successful in creating a supranational structure that is above the member countries, with a legal binding power. There are a number of lingering problems plaguing the European Union in recent years, yet I would like to highlight two of them. One is the so-called “PIGS”, four countries (often written as “PIIGS”, adding another country); which is an acronym for four (or five) member states of the EU that have economic problems and often sunk in debt. The countries are Portugal, Italy, Greece, Spain (with the addition of Ireland later on). The countries have a number of economic bubbles, much too high in expenditures, and under competitive economies. During the crisis, countries like this often ask for economic bail from the EU, creating problems for the EU to support countries in crisis. Another issue is about Turkey. The EU itself has noted Turkey as one of the potential members of the European Union in the future. However, the admission of Turkey has met with controversies. Turkey has actually applied for membership in 1987, however it has never been approved by the EU. There are a lot of contentions that the EU should not accept Turkey to be one of the new members. Various reasons have been cited, from political to economic reasons. Many scholars believe Turkey’s admission would be still in the distant future. Lastly, the European Union may stimulate (or deter) other regions of the world from creating a similar form of cooperation. It is true that the trend of regionalism is increasing after the demise of the Cold War (e.g. APEC, EU); however the only regional cooperation that passes through the five stages of integration is still the EU. There is one comparable regional organization, which is the ASEAN. However, many think that ASEAN would never reach what the EU is able to reach in its years, due to a lot of reasons (e.g. consensus v. legal binding). It is still to be seen whether the EU will progress to a next level of cooperation, or it will doom soon, that no other regions would like to follow the same trail as the EU did. Bache, I., & George, S. (2006). Politics in the European Union (2nd Edition ed.). New York City, New York, United States of America: Oxford University Press. Beasley, R. K., Kaarbo, J., Lantis, J. S., & Snarr, M. T. (Eds.). (2002). Foreign Policy in Comparative Perspective: Domestic and International Influences on State Behavior. Washington, DC, United States of America: CQ Press. Cohn, T. H. Global Political Economy: Theory and Practice. United States of America: Pearson. European Commission. (2007). How the European Union Works. Belgium: European Communities. Goldstein, J. S., & Pevehouse, J. C. (2008). International Relations (2008-2009 Update ed.). Upper Saddle River, NY, United States of America: Pearson Higher Education. Kesselman, M., & Krieger, J. (2009). European Politics in Transition (6th Edition ed.). Boston, MA, United States of America: Houghton Mifflin Company. McCormick, J. (2010). Comparative Politics in Transition (6th Edition ed.). Boston, MA, United States of America: WADSWORTH CENGAGE Learning. Goldstein, J. S., & Pevehouse, J. C. (2008). International Relations (2008-2009 Update ed.). Upper Saddle River, NJ, United States of America: Pearson Higher Education. Kesselman, M., & Krieger, J. (2009). European Politics in Transition (6th Edition ed.). Boston, MA, United States of America: Houghton Mifflin Company, p. 472. Kesselman, Krieger, op. cit., p. 489.